We are proud to present our patients with the latest innovation in gum disease treatment: The Perio Tray®. The Tray is a noninvasive and convenient way to keep your gums healthy. Now you and your family members can protect yourself from tooth loss, halitosis, and jawbone dysfunction in your own home. Gum disease is also linked to heart disease, diabetes, and other serious whole body health issues. It is pivotal to receive regular gum disease checkups and treatments from your experienced professional. How Does the Perio Tray® Work? Dental cleanings can treat the bacteria that causes gum disease, but when you return home, the buildup may begin again. Bacteria cells can grow back within hours after brushing your teeth or receiving a professional cleaning. The Perio Tray® by Perio Protect gently applies medication deep under the gums, where basic brushing and flossing can’t reach. You will fill the thin plastic Tray with the mixture of gum medication that your dentist sees fit. 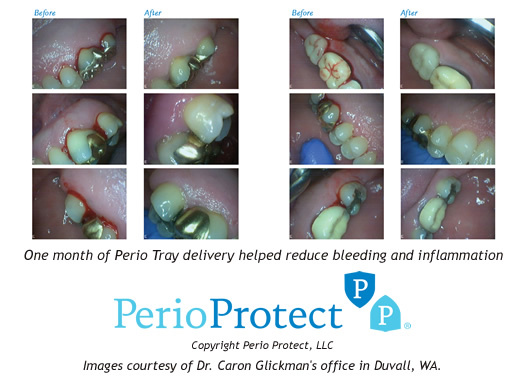 If you wear your Perio Tray® for just minutes each day, you can avoid the dangers of periodontal disease. Our patients are pleased by the comfort and flexibility of the Tray, which will be custom-fit precisely for your mouth. When is the last time you received a gum assessment? To learn more about how you can safeguard your oral health with Perio Protect, please contact our office today! Dr. Arabatyan made an excellent impression on me. Both he and his staff displayed good knowledge and a kind bedside manner. I will be returning and bringing the rest of the family for their regular dental care. I have never had a dentist explain every single thing to me. It will make my experiences less nerve racking, I am actually looking forward to my next visit. Thank you for being so amazing !! My brother; Marcos said you were ! awesome, professional and friendly service is the norm with this doc! I've been coming here for years. Dr and staff are super friendly and professional. They've always gone the extra mile to ensure my smile is its healthiest and best it can be! Serving the San Francisco Bay Area conveniently located in Union Square.